Written by Lexi Baysinger. Media by Kelsey Neier. Nerves raced through the performers as the start of the event drew closer. Each artist sending out last minute prayers and going over their lyrics in their heads. ; they all worried that they would be the one to forget their lines. At least, that’s how I would have been. 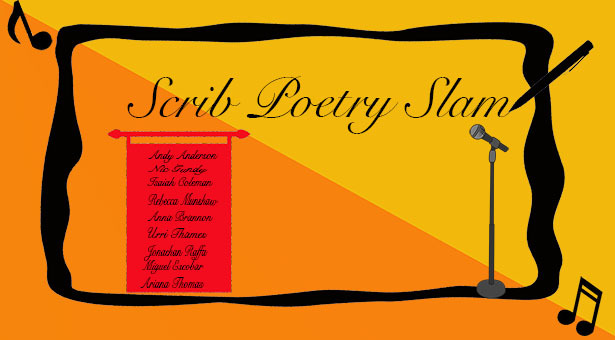 It was the first annual Scrib Slam, allowing all the creative types on campus an outlet to showcase their talents. The event was hosted by Andy Anderson, an editor for the Scriblrus, Greenville College’s online literary and art publication. Between performances, and he kept the audience laughing and having fun, sharing not only other comedians’ work but his own poetry as well. 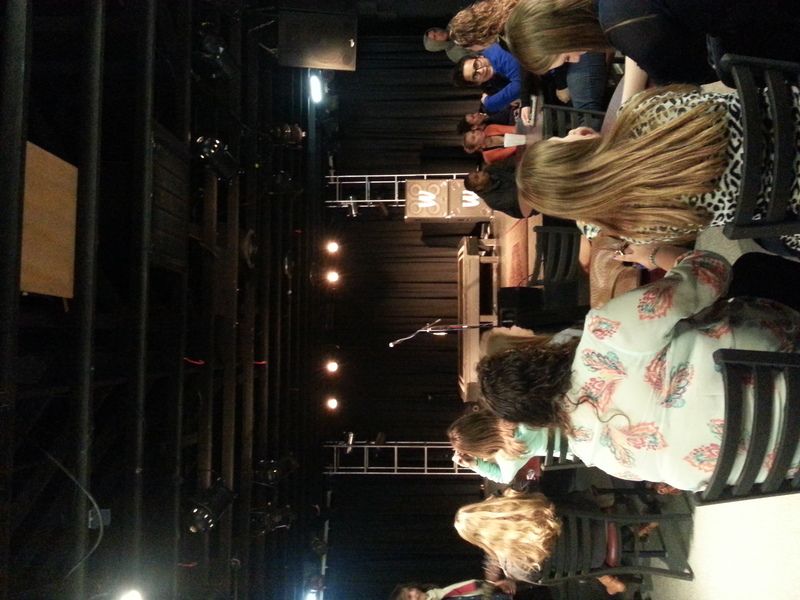 The crowd eagerly awaits the beginning of the Scrib Slam. Media by Kelsey Neier. 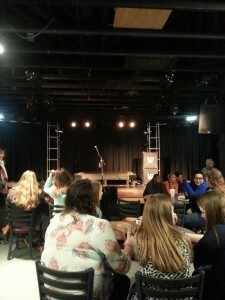 The show ranged from spoken poetry to covers and original songs by campus musicians. Nic Gundy open and closed the show playing an instrumental piece of his acoustic guitar and later playing and singing a cover. Isaiah Coleman performed spoken poetry. Isaiah spoke about his want to express his love for God and how past experiences had made him keep that love out of his life. But he found his outlet in poetry and shared two pieces titled “Belief” and “Forgiveness”. Each poem spoke about a new life that loving God has given him. Throughout his performance, Isaiah emphasized the idea of speaking up for Christ and how important it is for Christians to do so. After Isaiah came Rebecca Munshaw and Anna Brannon. Becca played the guitar as her and Anna’s voices filled the room with the cover Of Monsters and Men’s “Little Talks”. Then Urri Thames played an instrumental piece on the keyboard, surprising a few in the crowd that didn’t know he could play. His performance put the audience in a state of relaxation they hadn’t felt since spring break. Jonathan Raffa followed Urri’s lead and played “Take Me There” by Jimmy Needham. The song meant a lot to him because he played it at a time when his best friend’s father had passed away. He got the audience involved and had them create the beat by clapping and stomping. The song was about going to heaven. After Jonathan, Miguel Escobar took up Nic Gundy’s guitar and treated the audience to two of his songs. During his performance, he encouraged the audience to laugh and to help him name the first song he played. The second song was one of his more popular songs, known by many as “The Mars Song,” but is actually titled, “ I Think I See Mars.” Ariana Thomas was the last new artist to take the stage and bravely took the chance to sing a cappella, without background music. She sang two songs and at the end of her performance shared some advice with the audience. She told us that she learned a lot since her time at GC, stating that we have to use the gifts that God has given us. In doing so, we have to be patient with them and allow our gifts to develop; they aren’t going to be perfected overnight. The skill of my fellow students never ceases to amaze me. God blessed each performer with a mind strengthened against forgetfulness. He worked through the musicians to bring people together and I continue to be awed at the power that music has to do that. God also used the poets to show us the power of words and how a simple phrase can turn person’s life around. Overall, it was passion that consumed the people who had the courage to take the stage in front of their peers. The Scrib Slam turned out to be a success, spreading the message to the audience that we shouldn’t be afraid to use the gifts that God has given us. He then provided a way for us to do so through the Scriblerus. If you’re interested in getting your work out there, head over to scriblerus.greenville.edu or contact Prof. Rachel Heston-Davis for more information. Next articleDiversity and the Church.